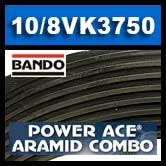 10-8VK3750 Bando Power Ace Aramid Combo (Banded) V-Belt. 10 Bands. Home > Heavy Duty V Belts > Power Ace Aramid Combo (Banded) 5V or 8V Sections > Click here for 8VK Section. 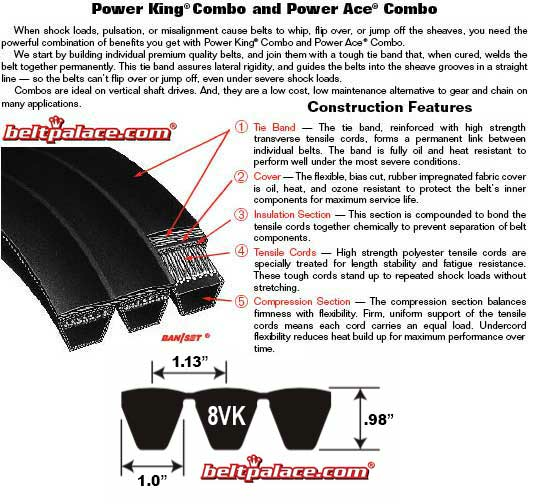 Bando Aramid Combo (Banded) V-Belts > 10-8VK3750 Bando Power Ace Aramid Combo, 10 Rib. CALL FOR FREE GROUND SHIPPING! (317) 519-9020. M-F.
10-8VK3750 Bando Power Ace Aramid Combo, Premium Grade. Specs: 375" Length Effective Outside Circumference, 10 Rib, 8V-K Section (Aramid/Kevlar). Classical 10-8V3750 (10 Rib) Powerband/Combo belts. ABOUT 6 LEFT IN STOCK (TX) ORDER NOW!